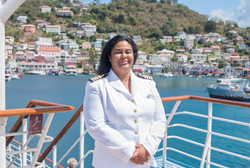 We are thrilled to have appointed Belinda as Windstar’s first-ever female Captain and we understand may be the cruise industry’s first-ever black Captain. Small ship luxury cruise operator Windstar Cruises, has announced the promotion of Belinda Bennett to Captain of the MSY Wind Star. Bennett claims several firsts with her appointment including the first woman and first black person to operate at the helm of a Windstar Cruises vessel since the company’s inception in 1984. Bennett, a British citizen, resides in Southampton, United Kingdom and also claims the distinction of being among just a few British woman cruise passenger ship captains as well as a pioneer for minorities working in the cruise industry, understood to be the first black cruise ship captain. Bennett’s maiden voyage as Captain set sail on January 30, 2016 with 102 international crew aboard the 148-passenger 5,307 GRT motor-sail yacht Wind Star cruising in the Caribbean. Bennett, 39, shares the title of Captain with an exclusive handful of women currently operating under that role within the cruise industry. As such, Bennett is responsible for directing the operations and activities of officers and crew members on board, including: safety, maintenance, certification, documentation, passenger services and compliance with multi-government regulations. Windstar captains are highly accessible operating under an Open Bridge policy, Bennett is known for being sociable, charming and engaging with Windstar yacht guests. Hailing originally from St. Helena – a part of the British Overseas Territory, encompassing Ascension and Tristan da Cunha islands – Bennett naturally became immersed with life at sea, having started as a Deck Cadet at age 17 on her home island ship the RMS St. Helena. Just four years later, she climbed the ranks as Third Officer and ultimately stayed on board for an additional five years, until departing in 2003 as Second Officer. Following a brief stretch as Chief Officer for the SS Delphine, a private charter yacht, and Isle of Man Steam Packet ferries, Bennett joined Windstar Cruises as Second Officer at the Port of Monaco in September 2005. Bennett worked on a variety of Windstar Cruises ships over her 11-year career with the small ship luxury line transitioning to chief officer and now captain. Currently sailing in the Caribbean as master of the 148-passenger sailing yacht MSY Wind Star, Bennett will captain the ship’s upcoming Trans-Atlantic repositioning to Europe where the ship will enter a 2-week drydock debuting April 16 on the 8-day “Treasures of Southern Spain & Morocco” cruise followed by a 6-day “Islands of the West Med” cruise and 7-day “Enchanting Greece & Amalfi Coast.” Bennett’s newly appointed title will keep her busy at sea into May, at which time she intends to enjoy a brief break before returning for Wind Star’s summer season in the Aegean Sea, offering a series of 24 consecutive “Greek Isles & Turkish Delights” cruises, Windstar’s iconic 7-day sailings between Athens and Istanbul. Images of Bennett are available for download here: https://windstarcruises.webdamdb.com/lightbox/downloadlightboxqueue.php?method=getfile&k=fmHjQXnhAzN0rwF1&source=4. For more information, including rates and itineraries, contact a travel professional or call Windstar at 1-800-258-7245, or visit http://www.windstarcruises.com. Windstar Cruises operates a six ship fleet of small luxury sail and power yachts visiting 150 ports throughout Northern Europe, the Mediterranean, the Caribbean, Costa Rica, the Panama Canal, and sailing year-round in Tahiti and the South Pacific. The small cruise ships are known for an intimate yacht-style experience, unique itineraries and exclusive access to the world’s best small ports and hidden harbors. Windstar’s fleet recently doubled, making the cruise line the market leader in small ship cruising with a total of 1,242 passenger berths. All ships in the fleet have recently undergone multi-million dollar transformations to embody casually elegant yacht travel. The power yachts Star Breeze, Star Legend and Star Pride serve 212 guests in all suite accommodations; while sailing yachts Wind Spirit and Wind Star sail with up to 148 guests, and Wind Surf serves 310 guests. The yachts cruise to 50 nations worldwide. Windstar Cruises is a part of Xanterra Parks & Resorts®, which is known for its “Legendary Hospitality with a Softer Footprint.” Xanterra’s entities also include lodges, restaurants, tours and activities in national and state parks, as well as resorts, railway and tour companies.